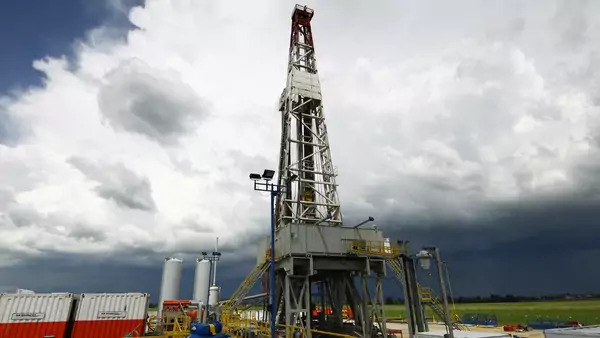 Hydraulic fracturing has unlocked huge reserves of shale gas and oil, transforming the energy outlook in the United States and the world, even as local opposition and falling world prices threaten the industry. Geologists have known about vast reservoirs of natural gas and oil trapped in shale formations across the United States for decades, but until recently cost-effective extraction techniques weren’t available, and the resources remained untapped. Shale didn’t factor into most serious analyses of U.S. energy prospects until the combination of two old technologies—horizontal drilling and hydraulic fracturing, known colloquially as fracking—was perfected. A drilling renaissance over the past five years has transformed the United States into a leading natural gas producer and potential oil and gas exporter, reversing a decades-long trend of increasing reliance on foreign sources of oil and gas. The results have been dramatic. Shale production helped reduce net imports of energy by one-third between 2011 and 2013, according to the U.S. Energy Information Administration (EIA), and by 2014 foreign petroleum imports had fallen nearly 40 percent compared to 2006. These changes hold broad implications for global markets and international relations. Meanwhile, global energy prices have fallen, and many other countries are studying the U.S. example and plan to tap their own shale resources. But analysts, environmental groups, and governments are concerned about the costs of fracking and the risks to the environment, while falling oil prices have begun to contract investment in the sector. What is fracking, and where is it happening? Hydraulic fracturing, or fracking, refers to two processes used to extract natural gas trapped in shale formations. The first step is to drill down to the sedimentary rocks, sometimes as far as ten thousand feet, then drill sideways for a mile or more. This horizontal drilling has been widely practiced since the 1980s to extract conventional oil and gas. Then, since shale gas is trapped in dense layers of rock and can’t flow through the well by drilling alone, producers must deploy hydraulic fracturing—first introduced into commercial practice in 1947 and effectively combined with horizontal drilling in the late 1990s—which pumps millions of gallons of water, sand, and chemicals at high pressure to open fractures in the rocks, allowing oil and gas to flow. Fracking is used in nine out of ten natural gas wells in the United States. Horizontal drilling and hydraulic fracturing have allowed producers to tap into large tight oil, shale oil, and shale gas deposits—some of which span multiple states—in the United States, such as the Barnett, Permian Basin, and Eagle Ford shales in Texas; the Fayetteville in Arkansas; the Haynesville in Louisiana; and the largest, the Marcellus, which spans Pennsylvania, New York, and Ohio. Then there is the massive Bakken formation, centered in North Dakota, which has remade the energy map in the United States and around the world, becoming a top global producer and producing more than one million barrels per day of oil in 2014. How much oil and gas can fracking unlock? Though basic fracking techniques have been available for decades, technological breakthroughs in the 1990s paved the way for newfound commercial viability in the shale sector, as CFR Senior Fellow Michael Levi recounts in his book The Power Surge. As Levi explains, while the EIA, which publishes widely anticipated annual reviews of the sector, didn’t even include shale gas in its 2009 outlook, by 2012 the EIA was reporting that more than one-quarter of U.S. natural gas production was from shale—a figure the EIA estimated would increase to one-half by 2035. The EIA’s 2014 outlook [PDF] shows that proved natural gas reserves (a category of resources that have been established to be economical to extract under present conditions) increased nearly 10 percent in 2013 to 354 trillion cubic feet (tcf), while the more inclusive measure of “technically recoverable reserves” amount to over six hundred tcf—nearly one-tenth the global supply. Meanwhile, tight oil, which is extracted from shale and other rock formations, has been the fastest-growing segment of U.S. crude production, hitting nearly 4.5 million barrels per day by the end of 2014, up from nothing in 1999. The EIA projects that tight oil could remain the largest contributor to domestic supply for at least another decade. Globally, an EIA-commissioned estimate of technically recoverable resources, produced by Advanced Resources International (ARI), found that 10 percent of the world’s crude oil and 32 percent of natural gas comes from shale formations. In the long term, the EIA expects U.S. shale gas production to continue rising through 2040. Such projections are difficult, however, since the viability of deposits depends on a number of unknowable factors, including the future of energy prices, global demand, and technological developments. What are the environmental risks associated with fracking? Although natural gas burns cleaner, emitting less carbon dioxide than oil or coal, producing it can negatively impact the environment in a number of ways. Water supplies are one area of concern, as millions of gallons of water have to be trucked in to each well, sometimes diverting water from other uses. The often hazardous chemicals used for fracking can be released through spills, leaks, or badly constructed wells. After a site is fractured, the resulting wastewater must then be treated and either disposed of or reused. The industry practice of temporarily storing wastewater in open pits has prompted concerns about the contamination of freshwater aquifers, and a Duke University study [PDF] found elevated levels of radium, bromide, and other contaminants in wastewater released into local streams from a treatment plant in western Pennsylvania. The scientific findings on these impacts is mixed. A 2014 New York state health department report synthesized multiple studies carried out across the United States, finding serious concerns in areas including respiratory health, drinking water, seismic activity, soil contamination, and impact of new roads and infrastructure on local communities. However, an earlier report from New York’s environmental conservation department determined that the risks were manageable, while an energy department report found no evidence that fracking tainted drinking water. And in June 2015, a long-awaited draft report from the Environmental Protection Agency (EPA) found no "widespread, systemic impacts" on drinking water. The climate change implications of fracking are hotly debated. There is an ongoing debate over the amount of methane, a potent greenhouse gas, released by the fracking process. A 2013 University of Texas at Austin study [PDF] found that the volume of escaped methane gas produced by fracking wells was lower than government estimates. Other research, such as this October 2014 study, has found that methane leakages, as observed by satellite, may be higher than previously thought. Finally, seismic activity is a concern because both the fracking process and the practice of injecting wastewater into deep wells can cause earthquakes, according to the U.S. Geological Survey. Youngstown, Ohio, for instance, has become an epicenter of seismic activity, likely due to an injection well. The New York health department report also points to the dramatic increase in earthquakes of magnitude 3.0 or higher in Oklahoma: There were over 140 such earthquakes in 2014, up from a pre-2009 average of just 1.6 per year. How is the government regulating fracking? Oversight falls primarily to local and state governments, each with varying enforcement priorities. Critics have accused the federal government of being weak on fracking due to Congress’s controversial decision to exempt the practice from EPA drinking-water regulations, through an exception inserted into the 2005 Energy Policy Act. And although President Barack Obama campaigned on shifting the country away from fossil fuels, the federal government has not stood in the way of oil and gas companies expanding U.S. energy production. Bills have been introduced to both increase EPA authority to regulate fracking, as well as to loosen federal oversight, but Congress has not taken action in either direction. Still, expanded national regulation may be on the horizon. The EPA has proposed fracking operations to report more thoroughly on their greenhouse gas emissions, and may soon require companies to disclose all of their chemicals. In March 2015, the Department of the Interior released broad new rules on chemical disclosure, well standards, and wastewater disposal for all fracking operations taking place on federally managed lands, drawing an immediate legal challenge from energy companies. State level regulation can be sensible, but there is a question of whether there is an important federal overlay needed. Meanwhile, local authorities are moving forward. In New York, Governor Andrew Cuomo announced a total ban on the practice in December 2014 in the wake of the state’s health department study. Over half of New York’s shale was already off limits due to local moratoriums or bans, and similar grassroots opposition has spread nationwide. Voters and city councils in Colorado, Ohio, Texas, and elsewhere have increasingly clashed with energy companies over local restrictions on fracking. "State-level regulation can be quite sensible," says CFR’s Levi, given the diverse geologies and community attitudes that need to be considered. "But there is a question of whether there is an important federal overlay that’s needed. I think there should be, for the industry’s own good, because bad news in one state is going to migrate to others and affect prospects elsewhere." Common federal rules, in theory, can help companies to transfer rigs and procedures across the country more efficiently, Levi says. Are other countries exploring hydraulic fracturing? The 2013 ARI analysis of global shale formations outside the United States revealed that more than half of the world’s shale oil resources are located in Russia, China, Argentina, and Libya. Some countries see their shale resources as potential geopolitical game changers: Poland, Turkey, and Ukraine in particular harbor hopes of reducing their dependence on conventional gas from Russia and Iran. However, global shale exploitation hasn’t yet approached the scale seen in the United States. There are a number of reasons for this. In Europe, environmental concerns have led to widespread bans on fracking. France, which relies heavily on nuclear energy, has repeatedly ruled out exploration. The United Kingdom and Poland, by contrast, are more enthusiastic but have had disappointing first attempts at drilling. China is sitting on almost as much shale as the United States and Canada combined, but mountainous terrain, water shortages, and other restraints are hampering opportunities. At the same time, the confrontation over Ukraine has delayed Russia’s shale energy development. U.S. sanctions have restricted American firms from offering fracking technology, equipment, and services to Russian projects, severely handicapping previous plans by oilfield service companies like Baker Hughes, Halliburton, and BP to exploit shale oil reserves in Siberia and elsewhere. Has the rising supply of natural gas benefited the U.S. economy? Unconventional oil and gas activity has lowered energy costs, as well as prices, for a wide range of goods and services. IHS Global Insight, a consultancy and research firm, estimated the benefits to consumers at $1,200 a year in 2012. IHS also projected that by 2020 as many as 250,000 jobs may be directly created due to the shale boom, up from 150,000 in 2010, when analysts expect shale gas to contribute some $150 billion to the U.S. economy. North Dakota, where natural gas withdrawal tripled and crude oil production increased fivefold between 2007 and 2012, saw its real per capita GDP increase by nearly 11 percent, the fastest of any state in the nation. The shale revolution has also improved the U.S. energy export outlook. In September 2008, the United States thought it would soon need to secure new foreign supplies of natural gas. Now the country is set to become an exporter, with regulators approving the construction of five liquid natural gas (LNG) export terminals, the first of which has the potential to begin exporting before the end of 2015. At the same time, all of these gains are sensitive to price fluctuations, since fracking generally requires higher energy prices to stay profitable than does traditional drilling. The price fall that began in the second half of 2014—with oil prices dropping more than 50 percent in six months—illustrates this danger. By January 2015, companies were telegraphing their intentions to reduce shale operations, with ConocoPhillips, the largest U.S. exploration and production company, planning to cut capital spending by 20 percent by deferring shale projects. And many shale producing companies have also incurred major up-front debt—the sector is more than $160 billion in debt—which could constrain the ability of smaller companies in particular to continue financing exploration and production in the event of sustained low prices. Find comprehensive data and analysis on the oil and gas sector in the U.S. Energy Information Administration's Annual Energy Outlook. CFR Senior Fellow Michael A. Levi’s book The Power Surge: Energy, Opportunity, and the Battle for America’s Future analyzes the United States’ rapidly evolving energy landscape. This CFR Energy Report by Harvard’s Robert Z. Lawrence evaluates the implications of reduced oil imports for the U.S. trade deficit. This Congressional Research Service report examines the natural gas industry in the U.S. economy. Case Western Reserve Law Reviewlooks at the law and policy of hydraulic fracturing. ALS Global provides an updated, state-by-state breakdown of local regulations on fracking. The CFR Energy Brief, "The Shale Gas and Tight Oil Boom: U.S. States Economic Gains and Vulnerabilities," by Stephen P. A. Brown, professor of economics at the University of Nevada, Las Vegas, and Mine K. Yücel, senior vice president and director of research at the Federal Reserve Bank of Dallas, looks at the sector’s impact on U.S. jobs. The site FracFocus, a collaborative effort between regulators and the industry, provides voluntarily-reported information on fracking operations.